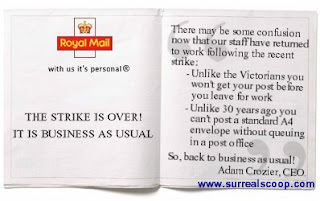 The Royal Mail today took out a double page advert in the quality papers to help clear up any confusion that customers might have following the recent mail strike. Unlike 30 years ago you will not be able to post a standard A4 envelope without queuing in a post office. So, back to business as usual!